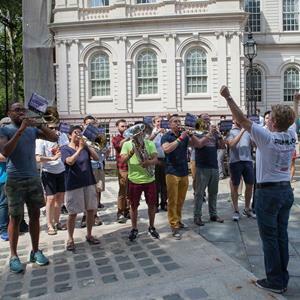 The Lesbian & Gay Big Apple Corps proudly introduces the newest members of our artistic leadership teams: Symphonic Band Assistant Conductors Fran Novak and Justin Stolarik, and Marching Band Assistant Drum Major Brian Luke. Candidates were given just a few weeks to prepare for auditions, when they would perform in front of the entire band. From the talented pool of candidates who auditioned for each role, with input from the band and final selection by our artistic directors, emerged our three new leaders. Grove’s 40th Invasion of the Pines: Celebratory, Controversial, Political, & Exhilarating!